When I started my health coaching business, I was working a full time job, but I wanted to be working on my business every waking moment. I was so excited to be helping people and finally pursuing my passion. I couldn’t wait until the day I would be able to hand in my resignation and confidently declare that I was a full time health coach. But it was a slow process. Working 40-hours a week only leaves so much time to pursue other things. I started by dedicating 2 evenings and one full weekend day to my business. I buckled down, I focused on what needed to be done, and slowly but surely my business began to grow. Eventually I had too much on my plate to maintain that schedule. That’s when I negotiated with my boss to go down to 3 days a week. This gave me even more time to meet with clients and manage my growing business, without getting burnt out. It wasn’t too long after that that I was able to leave my day job – and make health coaching my full time job! Building a health coaching business while working a full time job is a really exciting time. But it’s also a really BUSY time. 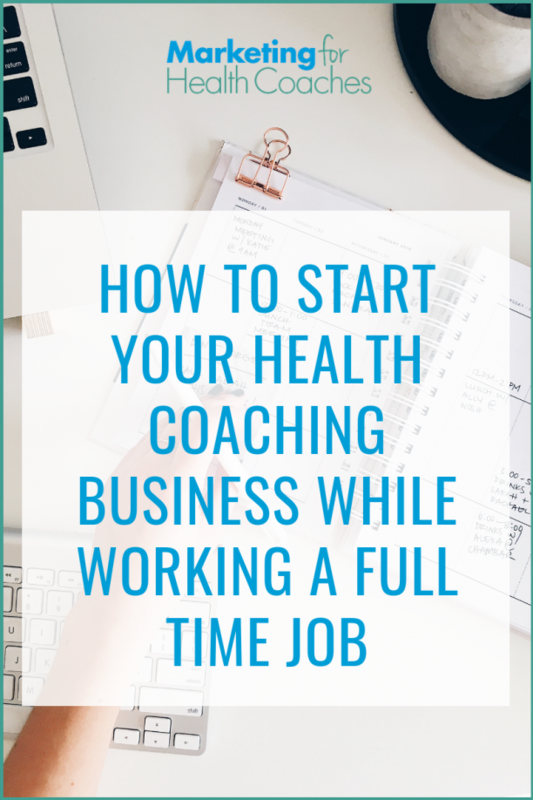 Even if you don’t have a full time job, you’re likely juggling other responsibilities that are limiting the amount of time you can focus on your health coaching business. Having a focused action plan makes a huge difference. When I was first starting out, I decided I could dedicate 2 full evenings and 1 weekend day every week. This gave me enough time to meet with clients or give talks during the week, and do strategic marketing on the weekends. This may not seem like a lot of time, but it was enough to make some real progress in the early months when I still relied on my full time pay check. Think about the hours you can put toward your business each week. 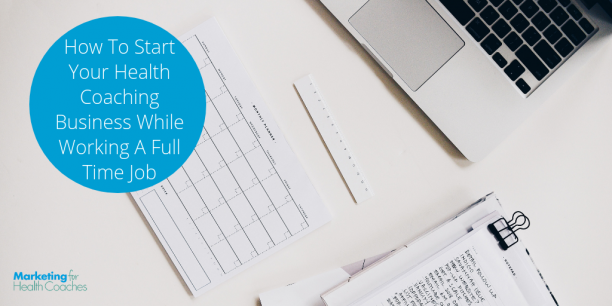 Pick your hours based on your energy levels, what your current full time job and other obligations will allow, and what will work for meeting with your clients. Be honest with yourself and what’s possible. As I tell my Health Coach Profit Lab clients, I don’t want you committing yourself to 20 hours per week if that’s not realistic. I’d rather you dedicate a solid 10 hours a week (or whatever’s possible for you) and be fully devoted to your business during that time… while also leaving time for self-care! You can set your alarm an hour earlier to get work done in the quiet hours of the morning. If you’re not a morning person, put in the time after work in the evenings. If your job allows for it, you can even put some time in over your lunch break. Or, maybe you dedicate some weekend time. Whether you have 2 hours or 10, you can make progress if you treat it as sacred time. Protect it. Make it a routine. Block off this time and be fiercely dedicated to maintaining it as your “business time”. Some people find that putting their business time in a calendar helps keep them accountable. If you use Google calendar, schedule your working hours and set it to repeat every week. Once it’s in your calendar (or day planner, if that’s more your style), treat it like you would any other appointment or meeting and never cancel on yourself. Building your business is a team sport – it’s going to take some support from your whole team (aka your family and friends). Talk to your family and friends about the time you’re dedicating to your business. Let them know you need their support in order to build your health coaching business. Set boundaries with your family and friends early so they respect your time. Blocking off time for your business will likely mean saying no to other things. Give yourself permission on this one! This might mean you need to have conversations with your partner or your family about getting support in the form of extra childcare, help with after school pick-ups, or getting your groceries delivered. You might want to let friends know when you will (and won’t) be available for social plans or other commitments. If you’re used to be the one to usually raise your hand and volunteer to help, this might be the year you give yourself permission to leave your hand down. Whatever you need to free up the time, communicate it…. First communicate it to yourself (this is actually the most important piece!) and then to others in your life. Your family and friends want you to succeed, but they need to know how they can help you. When you’re in the early stages of building your business, it’s easy to want to dedicate every free moment to it. Trust me, I’ve been there! The desire to help people and make your coaching business work can be so all consuming that you stop doing anything else. This is a road to burn out! Self care is absolutely essential for your success. You ARE your business, and if you’re not in good health, neither is your business. I know I’m preaching to the choir here. After all, this is what you teach YOUR clients! But, being a health coach does not make us immune to gradually letting our self-care go out the window. Build self-care into your schedule. If the schedule you created for yourself doesn’t leave any room for YOU, you may want to revisit it. A weekly date night with your partner, or a weekly meetup with your girl friends. Self care is different for everyone. You know what you need to feel good, so make sure you keep up with it. When I was starting out, I found it was important to have a plan. Otherwise, time can fly by and before you know it… weeks or months have passed and you feel like you’ve spent a lot of time and energy, but haven’t accomplished much. You have precious time to dedicate to growing your business outside of your full time job, so you do really need to make the most of it. This might seem like a bold statement, but, if you want to start bringing in 3-5K per month consistently, and quit your full time job faster, your best bet is to put all of your focus into getting one-on-one clients. This is the same advice that I share with all of my clients when they’re trying to get their footing as a new health coach. When you’re working a full time job, focusing on one-on-one clients will give you a higher return for your time. This means reaching your income goals faster, which will allow you to replace your paycheck and leave your day job sooner. I see a lot of new coaches attempting every marketing strategy in the book. If you’re doing as much marketing as possible, you’re casting the widest net, right? Eventually something has to work… right? But attempting multiple marketing strategies at once means you’re spreading yourself thin. It isn’t sustainable, and your efforts won’t be as effective as they could be. When you’re splitting your time, you can’t be dedicated to any particular strategy, so you make less progress on EVERYTHING. This means your marketing is less likely to work since you aren’t fully committed. If you’ve only got a few hours a week to market your business, focusing on one strategy will get you much further. You could be booking a talk each week and be on your way to getting clients! At the end of the week, you have a bunch of partially complete projects but you’re no closer to getting in front of your clients. That’s frustrating and will keep you in struggle mode. We want to shift out of that and get you on a path to success! The key thing you can do with your marketing time to get the best results is to focus on ONE strategy at a time. Choose the right strategy for your stage of business, and devote all of your marketing time to it. You’ll become the master of that strategy and you’ll have the results to show for it. Building a successful health coaching business while working a full time job is 100% possible with a clear strategy, some dedication, and the right focus. Struggling as a new health coach to get clients? Join me on Facebook, Wed, 4/3 at 2pm ET. I’m sharing what it was really like for me my first year as a health coach – the good and the bad… in the hopes that you can have an easier journey! Click here to join me on Facebook Live. Which of these tips resonate with you the most? Do you have a clearer idea of how to make the most of your time?